Renton, Wash. - The Seattle Seahawks have traded guard Rob Sims and their first of two 2010 seventh-round draft choices (213th overall) to the Detroit Lions for defensive end Robert Henderson and Detroit's 2010 fifth-round draft choice (133rd overall), the team announced this afternoon. 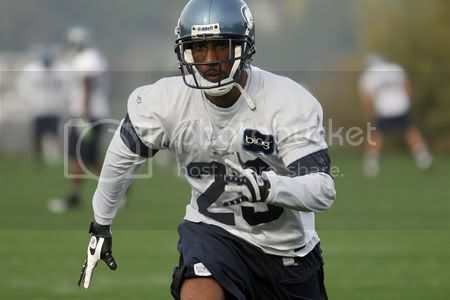 Sims was Seattle's fourth-round draft pick (128th overall) in the 2006 NFL Draft and started 34 of 45 career games played. He started all 16 games in 2007 and all 14 games played last season at left guard. Henderson was the New York Giants sixth-round draft pick (199th overall) from Southern Mississippi in the 2008 NFL Draft and signed with Detroit last season as a free agent, where he spent 11 games on the Lions practice squad. Renton, Wash. - The Seattle Seahawks have waived running back Xavier Omon and terminated the contract of tight end John Owens, the team announced this afternoon. The 75th NFL Draft is set to run on April 22 to April 24. The Seahawks have nine draft picks including two in the first round. After a promising pre season last year where Seattle went 4-0, the Seahawks managed just 5-11 in the regular season prompting the Seahawks board to fire Head Coach Jim Mora. They have as of January appointed Pete Carroll as Head Coach for the 2010 season. Need analysis from NFL.com: A new coach and general manager, and the roster is being turned upside down. Among the remaining issues are the futures of left tackle Walter Jones and defensive end Patrick Kerney, which will really impact the draft decisions. If they have to replace both players, plus get a running back and a safety early, it may be too much to ask, even with two first-round picks. The decision to trade for quarterback Charlie Whitehurst was questioned by fans and the media, but time will tell. Ultimately, it may say more about the draft class at QB than anything else. There is still a chance Brandon Marshall winds up here before the draft is over. Coupled with that potential move, if they can grab a left tackle and a safety like Eric Berry or a defensive end, they will contend in 2010. Expect the Seahawks to be active trading picks and moving around throughout the draft. After two forgettable seasons – and only nine wins – the Seahawks will begin a new era Tuesday during their first minicamp under coach Pete Carroll. There have been meetings. Countless hours of them. There have been workouts during the offseason program. Four days a week for the past month. But the Seahawks have yet to hold a practice under coach Pete Carroll. That will change Tuesday, when the veterans open a three-day minicamp – the extra one teams with new coaches are allowed to hold. And change has been the operative word this offseason. There’s Carroll, and 18 new assistant coaches. There’s first-year general manager John Schneider. There’s the roster, which has seen eight players leave through trades, free agency or being released and another 10 replacement them. Just ask cornerback Marcus Trufant, the team’s first-round draft in 2003. Only one player who was with the Seahawks when Trufant arrived will be on the field Tuesday afternoon – quarterback Matt Hasselbeck. “We’ve got a long way to go to put this thing together, and this is the first step in doing that,” Trufant said after a recent workout. The players are scheduled to practice for two hours each day, from 1:30-3:30. It’s a first chance for them to apply everything they’ve been taught in meetings and – as Carroll has stressed several times – the first opportunity for their new coach to get a firsthand look at his players in a practice environment. Even for players as accomplished as Hasselbeck and Trufant, that means making good – and lasting – first impressions. Each battled injuries last season, when the Seahawks struggled to a 5-11 record. Trufant missed all of training camp and the first six regular-season games because of a back issue. Hasselbeck missed two games because of broken ribs, after sitting out nine games in 2008 with his own back problem. “The challenge will be – the hardest thing will be – having the play-caller tell you the play, stepping into the huddle and calling the play like you mean it, like you own it, like you know it, like you believe in it all the way,” Hasselbeck said. Consider different a synonym for change in that evaluation. After spending the first 11 seasons of his career in basically the same system – Mike Holmgren’s hybrid of the West Coast offense that Hasselbeck learned in Green Bay while he and Holmgren were with the Packers, and then mastered after his 2001 trade to the Seahawks – the three-time Pro Bowl quarterback is on his third offensive coordinator and third scheme in the past three years. But the offense being implemented by new coordinator Jeremy Bates is closer to what Hasselbeck learned under Holmgren than the system the Seahawks ran last year under coordinator Greg Knapp. But new is good this time around. “It’s exciting,” Hasselbeck said. “It would be harder to stomach if were coming off a great year and we all were together. But there has just been so much change and so much turnover in our locker room that wholesale change in terminology isn’t that big of deal because for the most part it’s all brand new people. The scheme hasn’t changed as dramatically on defense, because coordinator Gus Bradley is one of three holdovers from the previous staff. But there is the turnover in personnel, including strong safety Deon Grant being released and end Darryl Tapp being traded to the Philadelphia Eagles. “It’s pretty much a fresh start,” Trufant said. “Last year was a rough season – personally and for the team. It was a rough season all the way around. Patrick Kerney’s mind remained willing, but his body had other thoughts. The veteran defensive end announced his retirement on Tuesday, despite saying earlier this offseason that he planned to return for a fourth season with the Seahawks – and 12th in the NFL. After having surgery in each of the past four seasons, Kerney decided enough was enough. “Despite the desire to continue my career, I am retiring from professional football,” Kerney said in a statement released by the team. “The toll that has been taken on my body will no longer allow me to train, and hence, perform at a level that is acceptable to me. It was oft-injured tight end Christian Fauria who once joked that he had enough screws in his body to construct a bridge. But Fauria had nothing on Kerney, who will be 34 in December. After playing in 112 consecutive games – including 96 starts in a row – during his first seven seasons with the Atlanta Falcons, Kerney’s relentless style of play began to catch up with him. He missed the final seven games in 2006, his last season with the Falcons, because he needed surgery to repair a torn right pectoral. Even though he still was recovering from that procedure, the Seahawks signed Kerney to a six-year, $39.5 million contract when he became an unrestricted free agent in March 2007. 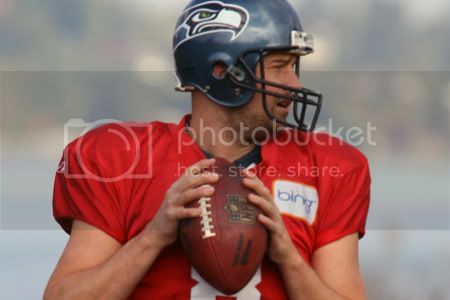 “In our preparations, we always had to prepare for him,” then-coach Mike Holmgren said after the Seahawks signed Kerney. “You prepare for the other team’s defense, but in playing (the Falcons) you had to prepare for him. I have always looked at that as kind of a compliment for a defensive player. Kerney started 16 games in that first season with the Seahawks, and for the seventh time in his career. But he needed postseason surgery after collecting 14½ sacks and being voted to the Pro Bowl. Kerney was named NFC defensive player of the month for November, when he had seven sacks among his 15 tackles, three forced fumbles and an interception in four games. He was also named 2007 NFC Defensive Player of the Year. In 2008, he was limited to seven games because of labrum and wrist injuries. Last season, he missed two starts because of a groin injury and then needed elbow surgery in January. When you play the position Kerney played, and the way he played it, those things will happen. Even to someone who takes immaculate care of his 6-foot-5, 272-pound body. “It’s tough to see guys you play next to move on – especially someone who is such a warrior, like Patrick,” defensive tackle Brandon Mebane said. “If you need an example of somebody who took care of his body, he was a prime example. Kerney also led the Seahawks in sacks last season (five) and was second in 2008 (five), despite his limited action. In three seasons with the Seahawks, Kerney played in 37 games, producing 116 tackles and 24½ sacks – running NFL totals to 659 tackles and 82½ sacks. He had double-digit sacks four times – 12 in 2001, 10½ in 2002, and 13 in 2004 while with the Falcons; and his career-high total in 2007 with the Seahawks. Only two players in franchise history produced more sacks in a single season than Kerney: Michael Sinclair, 16½ in 1998; and Jacob Green, 16 in 1983. Kerney also was named the Seahawks’ Man of the Year in 2008 for his efforts in the community.